Summertime is my favorite for many reasons, but one of them is the food (when is not about the food?!). Summer was made for grilling, for dining al fresco, and for fresh salads. I discovered this recipe in the stack of magazines that has been getting taller and taller even since Madeleine was born. I tweaked the recipe a little bit, substituting for ingredients I had, and this is now one of my new favorite pasta salads. The herb vinaigrette is reminiscent of pesto with the basil and parmesan, and I love the arugula tossed right in with the pasta. 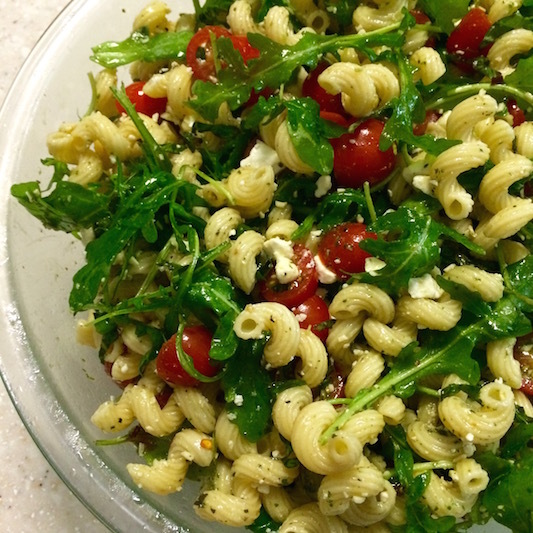 Hurry up and make this while you still have summer fresh basil and tomatoes! Prepare pasta according to package directions for al dente. Toss together pasta and olive oil in a large bowl. Add tomatoes, arugula, basil, and crushed red pepper to pasta; toss gently. Add 6 Tbsp of the herb vinaigrette to the pasta mixture; toss gently. Add salt and pepper to taste. Just before serving, stir in the feta and remaining vinaigrette. Makes 8-10 servings. Process red wine vinegar, lemon juice, and garlic in a food processor until smooth. With processor running, pour vegetable oil in a slow, steady steam, processing until blended. Add basil leaves and process until smooth. Add Parmesan cheese; pulse to combine. Stir in salt and freshly ground pepper to taste. Serve immediately, or refrigerate in an airtight container up to 5 days.